Seems obvious I know. 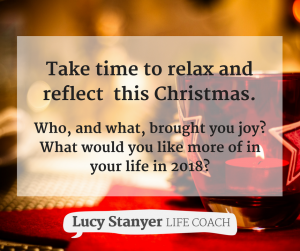 But it’s easy to overlook the importance of taking time out from Christmas planning, visits to Santa and seeing family and friends to stop and reflect. It’s a great feeling when we allow ourselves to take a step back and think about the goals that we set for ourselves in 2017 – whether we did this in a structured way or more informally. It can change our perception of our lives immensely once we actually write out what we have done and achieved this year. Some of it may be ‘on plan’ and other things may have happened as you’ve gone along. So why not take 15 minutes with a hot chocolate to recognise your achievements and feel more positive, capable and relaxed as you head towards the big day? What was the best thing that happened this past year? What was the most challenging thing that happened? What was your biggest personal change? In what ways did you grow emotionally, spiritually and physically? What was the most enjoyable part of your work life? What was the most enjoyable part of your home life? What was the most challenging part of your work life? What was the most challenging part of your home life? Did you have any unexpected joy this past year? Did you have any unexpected obstacles? What was your biggest time drain this past year? What was the best way you used your time? What was biggest learning from this year? Making plans for the New year…. When you’re done with reflecting on 2017, you can take the best bits forward into 2018! Check out my blog below on how we create our Family Inspiration Board over the festive season to create out vision for the year ahead. We’ll be doing ours this Friday in our PJs with the fire on, some hot chocolate and big stack of post it notes. Have a very Merry Christmas and a fabulous New Years Eve. See you in a fresh new year! Get in touch to book your free discovery session to find out how coaching can help you get clarity, confidence and improve your work-life-family balance. There’s no obligation and no charge for this 45 minute discovery call. If you like my approach, then we can book your first session and start your journey to making changes with confidence.